Encontrei 42 Hotéis em Pähl. Escolha a data de entrada e saída para ver os hotéis disponíveis em Pähl. Sem informar as datas, os preços com (*) são preços médios de cada hotel e nos arredores até uma distância de 10 km. Located in Pähl, this first-floor apartment features a balcony with mountain views. The unit is 40 km from Munich. Free WiFi is offered throughout the property. There is a dining area and a kitchen complete with a dishwasher, an oven and toaster. Towels and bed linen are featured in this self-catering accommodation. A separate entrance is also featured at Sunny apartment in Pähl. Garmisch-Partenkirchen is 46 km from Sunny apartment in Pähl, while Bad Wörishofen is 44 km from the property. You can engage in various activities, such as golfing and cycling. The nearest airport is Munich Airport, 68 km from the property. AmmerWinkl offers pet-friendly accommodation in Vorderfischen, 39 km from Munich and 49 km from Garmisch-Partenkirchen. Guests benefit from free WiFi and private parking available on site. The kitchen comes with a toaster, a fridge and a stovetop, as well as a coffee machine. Towels and bed linen are available in this apartment. There is a private bathroom with a bath or shower. Bad Wörishofen is 43 km from AmmerWinkl, while Bad Tölz is 36 km from the property. The area is popular for golfing and horse riding. The nearest airport is Munich Airport, 67 km from AmmerWinkl. Ferienwohnung Julia offers pet-friendly accommodation in Raisting. The property is 43 km from Munich and private parking is provided. There is a seating area, a dining area and a kitchen complete with an oven, a toaster and a refrigerator. There is a private bathroom with a bath or shower and bidet. Garmisch-Partenkirchen is 47 km from Ferienwohnung Julia, while Füssen is 49 km away. The nearest airport is Memmingen Airport, 66 km from the property. The Gasthof zur Post boasts a large banquet hall which can accommodate up to 400 people and includes a stage. It provides a charming location for private celebrations and events. Featuring free WiFi throughout the property, Hotel Engelhof garni offers accommodation in Tutzing. Free private parking is available on site. Certain units have a seating area to relax in after a busy day. A flat-screen TV is offered. Munich is 34 km from Hotel Engelhof garni, while Garmisch-Partenkirchen is 48 km away. Munich Airport is 63 km from the property. Just 700 metres from Lake Starnberger See, this non-smoking hotel in Tutzing offers soundproofed rooms with balcony, organic buffet breakfasts, and a garden. Tutzing Train Station is 400 metres away. The 3-star Hotel Garni Möwe has spacious rooms with wooden furniture, latex mattresses, and a flat-screen TV. All are suitable for guests with allergies. Wired internet is provided on request. In the mornings, guests can eat in the Möwe's cheerful breakfast room or outside on the terrace. Special diet options are available on request. The Tutzing Ferry Port is a 10-minute walk from the Hotel Möwe. Ferries run to the romantic Roseninsel Island in 30 minutes. The Tutzing Golf Club is 3 km away from the Möwe Hotel Garni. Horse riding, hiking, and windsurfing are also possible nearby. A Romantik Villa está localizada na cidade bávara de Andechs, apenas a 5 minutos de carro do Lago Ammersee. Disponibiliza suites bem equipadas, acesso Wi-Fi gratuito e um estúdio de beleza no local. Todas as suites do Romantik Villa têm uma moderna casa de banho, televisão por cabo e uma máquina de café. A Romantik Villa serve um vasto pequeno-almoço gourmet todas as manhãs. Uma variedade de tratamentos de beleza, como Thallaso e Pantai Luar Belle Visage, também estão disponíveis aqui. O centro da cidade de Munique fica apenas a 40 minutos de carro da Romantik Villa. Os hóspedes podem estacionar aqui gratuitamente. Offering a restaurant, Tutzinger Hof is located in Tutzing and just two minutes away from the large Starnberger See lake. Free Wi-Fi access is available at the accommodation. Each of the rooms comes with a private bathroom boasting a shower. There is a telephone in all rooms, and a TV is available on request. The traditional Bavarian-style hotel is just 10-minute walk away from Tutzing Train Station, and the hotel offer a free shuttle service to and from the station upon arrival and departure. Regional dishes can be enjoyed at the property. The property offers free parking. München Airport is 62 km away. Munich is 38 km away and Garmisch Partenkirchen is 57 km from the property. Este hotel de 3 estrelas fica no coração do encantador bairro antigo de Weilheim, a 10 minutos a pé da estação ferroviária. Apresenta quartos modernos e acesso Wi-Fi gratuito em todas as áreas. Todos os quartos para não fumadores do Hotel Vollmann incluem uma casa de banho privativa e uma televisão. Um rico buffet de pequeno-almoço é servido todas as manhãs no restaurante de pequenos-almoços do Vollmann. O Lago Starnberger See encontra-se a 15 minutos de carro. Os comboios partem para Munique a cada 30 minutos da Estação Weilheimer, apenas a 1 km. 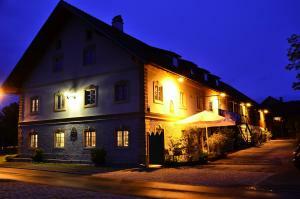 Evangelische Akademie Tutzing is located in Tutzing in a beautiful, historical building. Free WiFi access is available. Excellent views of and private access to the Starnberg Lake are offered. Fitted with wooden floors, each of the rooms at the property comes with a private bathroom with a shower. Extras include a desk and bed linen. There is a host of traditional restaurants, cafes and beer gardens within walking distance of the hotel. Munich is just a 30-minute train journey away. At Evangelische Akademie Tutzing you will find a garden and a bar. Other facilities offered at the property include a shared lounge, a tour desk and luggage storage. The property offers free parking. Munich Airport is 62 km away.